Derrick Kosinski & Scott Yager take YOUR QUESTIONS! We don't have a guest this week, so we get to have fun and spend some time diving into great questions from social media and from our Challenge Mania patrons. This episode was taped shortly before Scott left for New Zealand on 11/10. Towards the end of the episode, we include a clip from a previous Reckoning Review, which is our Patron-Only Bonus Podcast Series where we talk about The Challenge episode from that week over at ... See More www.Patreon.com/ChallengeMania. In this fun and lengthy sample clip, Derrick (@DerrickMTV) & Scott (@SHOTOFYAGER) are joined by Challenge expert and friend of the show Derrick Hutek (@DerrickHutek) to discuss the last three teams to leave The Final Reckoning (Shane/Nelson, Brad/Kyle & Kam/Kayleigh) and their potential for championships in the future. The guys also then break down the remaining five teams left on this season and discuss who has the easiest story to root for and the best chances at taking home the title. 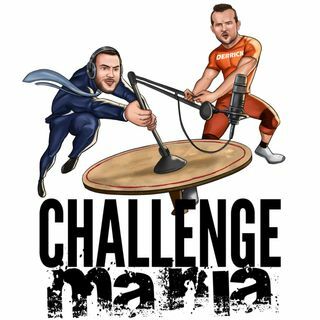 For MORE Challenge Mania, check out www.Patreon.com/ChallengeMania - We will have TWO Meet the Patrons podcasts this month, that are free for everyone to listen to. Not just patrons. All patrons have the opportunity to one day be selected to sit in the hot seat and be interviewed Challenge Mania style. This month it's Joanna Palmer & 100 Question Howard! Listen to their interviews this week and next week at the Patreon site. Head to www.Scentbird.com/MANIA and get 50% off their fantastic monthly cologne and perfume service, where they send you whichever brands you choose in a fun and practical size. Use the code MANIA for the discount! Poshmark is giving Challenge Manias $5 off their first order! Download the Poshmark app and start browsing all their amazing clothing items today. Use the code CHALLENGEMANIA for discount! Speaking of FREE SHIPPING, www.ChallengeMania.Shop has FREE SHIPPING on all orders over $45 from now until November 26th!